This past week, the hubby and I hauled all the kiddos to the Shedd Aquarium in Chicago. It’s always nice to get out of the house and do something together when he is home and has a day off. We’ve been to the Shedd Aquarium a bunch of time over the 4 years that we have lived here but this time we went with some friends. Usually, it’s just us that go but it was nice to go with someone this time and have our kids run a-muck around the aquarium together. Like I said before, I’m not a huge fashionista, and this is definitely not a fashion blog but I do love fashion and trying to find styles that work for me and my currently, ever-expanding waist-line. Then, in just a few short months I’ll be in the postpartum stage and trying, yet again, to find styles that work for that awkward stage where your maternity clothes don’t quite fit right but your regular clothes definitely don’t fit. Unless you’re one of those women (whom I totally envy) that can and do just “bounce back” and can fit into their pre-pregnancy jeans within a few short days, weeks, or month after giving birth to a newborn. Chelsea just started her new fashion blog and I thought it would be fun to team up to try and help each other out with photographs. I’ve done all my photos in the past with either my iPhone propped up on a box or, after upgrading to a DSLR, using that and a tripod and a wireless remote. None of which work out perfectly, but they do the job in a pinch or when there isn’t anyone else around to help out… aka the hubby. Chelsea and I already see each other regularly for playdates with our littles and dinner sans kiddos so it just seemed natural to start getting together for photo shoots, also. And we’ve both already got a bunch of them planned out for you! So, here’s my style for our little aquarium day together. Simple… jeans, boots, duster cardigan, and scarf (since it was freezing out that day). This outfit kept me warm while outside walking in and out of the aquarium but I could also take the cardigan off when I got hot inside the aquarium. Which is literally the main reason I love layering with cardigans and scarfs. 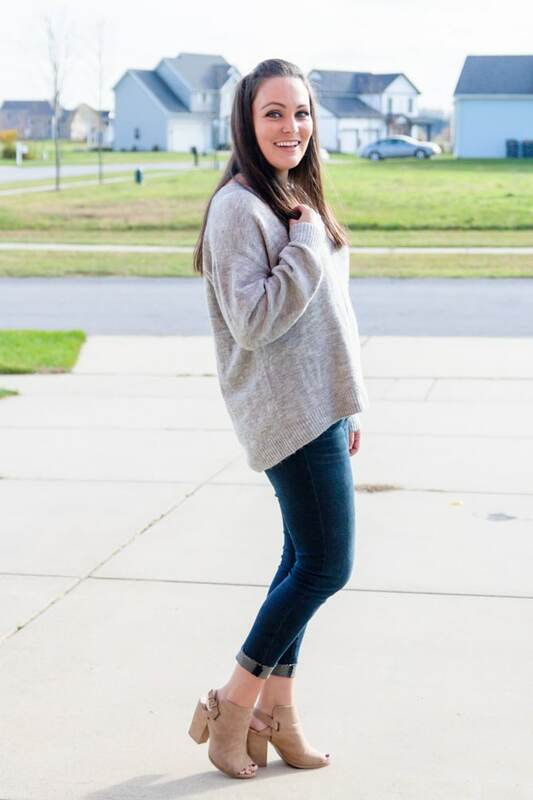 Head over to Chelsea’s blog and check out her style. Then if you want to know what I carry in that giant mint bag I have, check out my what’s in my camera bag post here.